The work of a noted English photographer leads to the discovery of a useful camera gadget. 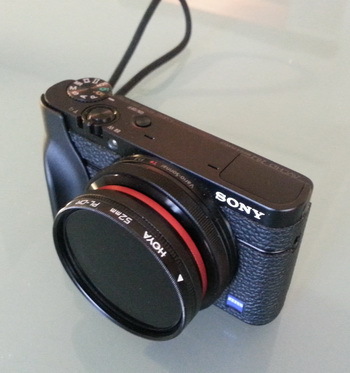 Also the latest tricked-up state of the Sony RX-100 is revealed. A while ago I discovered the work of James Ravilious, and in doing so picked up some lessons from his technique. Ravilious lived and worked in North Devon from the 1970s to the 1990s, taking elegiac photographs of the rural landscape and it’s population, and capturing a way of life that has almost completely disappeared. You can read about him here, and I also highly recommend this book of his photographs and approach. The BBC made a fine documentary about him, and information about it, and some archive footage can be found at this link. Ravilious shot only in black and white (unusual in landscape photography these days) largely because, as he said in the BBC film, it solved the problem of “green”. England is a very green country, and “greenness” creates a monotonal view, and one that it’s difficult to achieve much contrast or colour gradation in. Transposing to black and white allowed him a richer tone palatte, and to draw attention to the subject more subtly. I think the style really works – both in scenes of people or countryside. Another feature of his work was that he often shot into or at the sun – creating an ethereal glow around the subjects, and using strong shadows to draw the eye into the frame. To achieve this without lens flare, he endlessly experimented with lens hoods for his Leica cameras – you can read about the sophistication of his method in this fascinating post, and see examples of the effect here, here and here. The last one by the way was shot in France, and his approach seems just as effective there as in Devon. Looking at Ravilious’ work, I have been tempted to take more monochrome photographs and to shoot into the sun a bit more also. But of course that needs a lens hood, and for my RX-100, as with most compact cameras, there is no hood provided, and no thread on the lens to attach one. What to do? The answer came from the Carry Speed MagFilter Threaded Adapter Ring.This is a really handy adapter that consists of a very thin magnetic ring that glues to the front of the camera, and a threaded adapter that will then attach to the ring. This enables all kinds of filters to be attached to the camera – and different sizes are available for most good compact cameras. 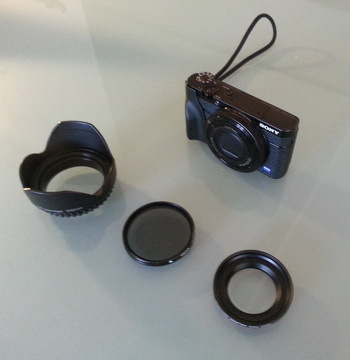 On the left is a circular polarizing filter attached to my RX-100 for example. The obvious next step was to see if a lens hood could be attached the same way – and indeed it could. I used this reversible lens hood from Amazon, and it works brilliantly, remaining securely in place. 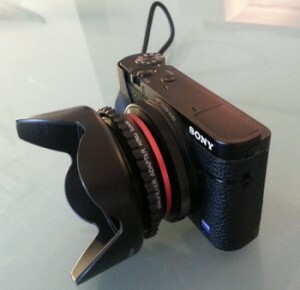 Wavy ‘petal’ hoods are designed this way because the camera sensor is rectangular but the lens is circular – the petal shape results from the intersection of of a rectangular pyramid with a circle, and is particularly helpful in eliminating vignetting on wide-angle lenses, like on the RX-100. Another recent accessory is the Richard Franiec camera grip, which you can see on the left of this shot. Most small cameras don’t have a ridge that you can grip the body with – so Franiec makes these lovely precision aluminium grips, that make one-handed photography vastly easier. You can find information and comments about it here and order one from here. 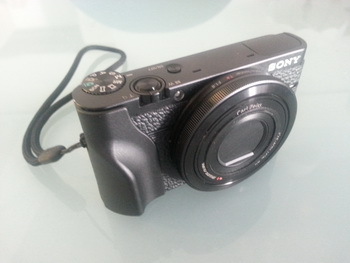 I have also added some Leica-like panels to the body of the camera – to improve the grip and appearance. All in all, these new bits have really improved the versatility of the camera, while still keeping the whole package pretty small. 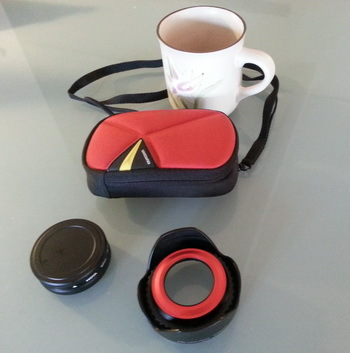 Here’s the camera in it’s current case, with all the accessories – shown next to a mug for size comparison. My next step is to add a few ND filters. These reduce the amount of light getting into the camera, allowing longer exposures in brightly lit situations – for example taking those dramatic cream-like shots of surf, or waterfalls. Further experimentation will be done on our next Cape Town trip coming up quite soon. In my next post, I’ll cover some shots done this month in London, using some of these accessories.